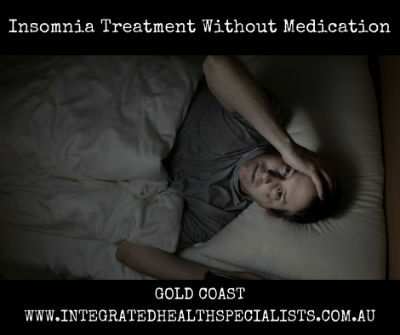 Are you looking for effective insomnia treatment without medication? Insomnia is the most common sleeping difficulty and affects people of all ages. Symptoms include difficulty falling to sleep, and/or problems staying asleep, worrying about sleep, and resultant tiredness during the day. People who suffer with insomnia usually experience one or more of the following: fatigue, low energy, difficulty concentrating, mood disturbances such as irritability or depression, and decreased performance at work or an inability to carry out normal responsibilities. There could be many different reasons for this sleep disorder, often commencing after a pattern of poor sleep that may start during a particularly stressful period or another sleep disruption, for example, jet lag, shift work, waking infants, or a snoring bed partner. It can then become chronic even after the initial cause is no longer present. The poor sleep pattern continues by a conditioning (habit forming) response that produces alertness whilst trying to fall asleep or stay sleep. Chronic insomnia is disrupted sleep that occurs on average at least three nights per week and lasts at least three months, this can really cause significant distress and depression. In the past three decades research has demonstrated that effective non-drug treatments can be very effective to improve sleep in all age groups. We have developed a proven Quit Insomnia Program that has a 98% success rate for treating insomnia without medication – using a successful combination of Hypnotherapy, Emotional Freedom Techniques (EFT) and Cognitive Behaviour Therapy (CBT). Don’t put up with this any more, it is debilitating and impacts so many areas of your life!